Syte allows brands and retailers to add a visual search component to their web or mobile app. When a user sees a style or item they like IRL, they can snap a photo of it and upload it to a company's visual search to easily browse similar items. 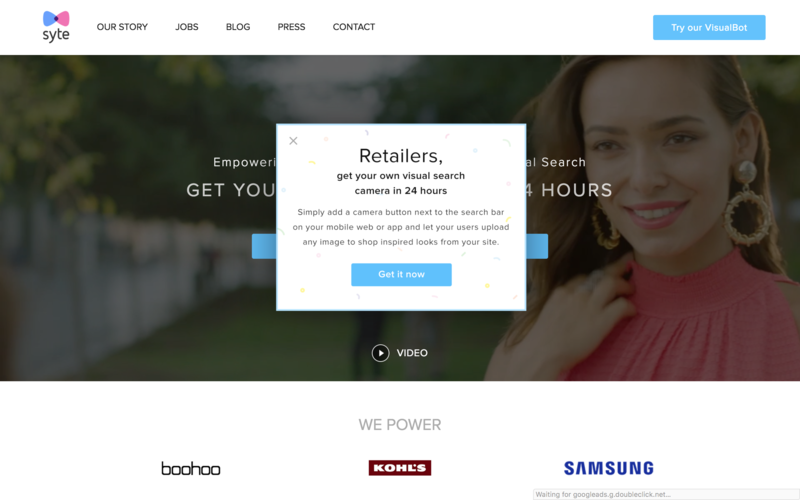 Syte displays an upsell modal to their website's visitors to encourage brands to add the visual search camera to their website. Syte promises that a customer's new camera would be up and running in 24 hours. Promising a time frame can help build trust as well as impress visitors who are thinking about buying. In the three lines of copy that follow, Syte is able to explain what they do and the value that the brand's customers would get from Syte's software. Syte is compelling because most shoppers don't see an item somewhere and then look it up immediately. Syte's tool encourages customers to see something, take a photo and then browse in the moment without having to type in all sorts of random characteristics hoping to find what they are looking for.